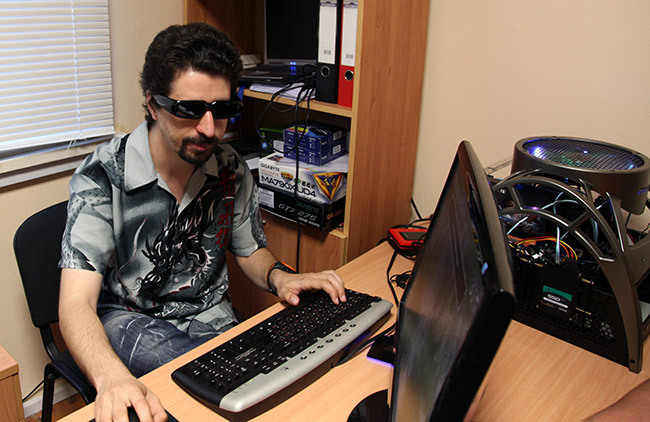 Welcome to the 3D Vision Blog, the blog of Anton Belev (also know as Bloody) for all things Stereoscopic 3D. Being a tech guy and a PC enthusiast for quite some time I have always been interested in different stereo 3D technologies that allow you to have a a depth perception for a computer generated image on a flat screen or a movies shot in a special way that you can actually feel like really being in the center of the action. Up until recently I was just testing different products and technologies, but now I decided to make a blog where I can share some interesting and useful information along with my personal experiences in the vast stereo 3D world. The thing that made me start this blog was the announcement of Nvidia’s GeForce 3D Vision that I got not long after it was released, but I won’t be writing just about the 3D Vision… there is much more to write about. I do own and use some other stereo 3D-capable products like eDimensional Wireless 3D Shutter Glasses, i-O Display’s i-Glasses, eMagin’s 3D Visor Z800, Panasonic VT20E 3D Plasma HDTV, Fujifilm Real 3D W1 digital camera and much more 3D-capable products. And I’m always looking into new and interesting products and technologies, reviewing them, acquiring some of them if possible and my budget allows it, so that I can experience and judge them personally, which I consider the best way, because most of the time the marketing hype is just too much.